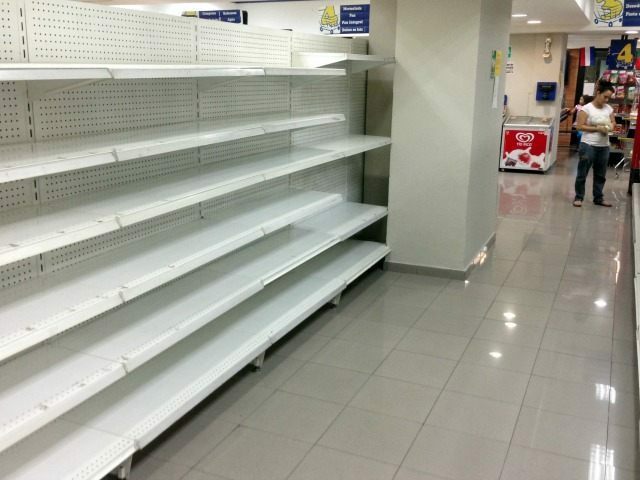 Venezuela’s opposition legislature has declared a “nutritional emergency,” proclaiming that the country simply does not have enough food to feed its population. The move comes after years of socialist rationing and shortages that forced millions to wait on lines lasting as long as six hours for a pint of milk, a bag of flour, or carton of cooking oil. Opposition legislator Julio Borges announced the measure on Thursday, which would allow the legislature to push for more imports on basic food goods and inspect government-owned food companies to ensure they are meeting efficiency standards. “This will make corporations and expropriated lands produce food again, will simplify the process of national and foreign investment, and establish incentives for investors,” Borges promised. Socialist party members are arguing that the decree goes beyond the scope of the power of the legislature and cannot override the executive decree President Nicolás Maduro put into motion in January, which declared an “economic emergency” and allowed the government to further intervene in private corporations. Venezuela’s Supreme Court extended the viability of the emergency decree this week, in a move many consider an attempt to keep the opposition legislature from asserting too much power over the food industry in Venezuela. Socialist legislators also warned that “a food emergency would be an excuse for an American intervention.” While most economic experts attribute Venezuela’s dire economic situation to years of socialist mismanagement and, more recently, the international drop in crude oil prices, Venezuela’s government has long blamed the United States. Most recently, Maduro blamed American officials for allegedly prompting a violent supermarket riot in which the fight for bags of flour left one dead. The situation grew so dire that, in January 2015, reports began surfacing of professional “line-sitters“: individuals who, for a price, would wait in a supermarket line and buy you the little your ration card could afford. The socialist government has proposed few solutions to this crisis. Last month, President Maduro insisted that those struggling to find basic foods should develop urban farming skills, claiming that all the eggs eaten in his household come from chickens he and First Lady Cilia Flores own. Borges, the opposition legislator at the forefront of the new emergency initiative, is demanding the National Assembly investigate government-held food corporations to ensure they are working efficiently. “We used to be a self-sufficient country, making basic products like white corn; today our arepas don’t have the pride of being Venezuelan, instead they are made with Mexican corn… we used to be self-sufficient on rice, and now we bring it in from the United States,” Borges lamented. Venezuela previously forced a Polar food distribution center in Caracas to shut down in July, putting 12,000 tons of food, six million liters of soft drinks, and 2,000 jobs at risk.